Please note: Treehouse VIP Packages do not include a ticket for the show! You must have a regular ticket for the specified Band, Date and Venue to attend a Treehouse VIP Package. experience the Soundcheck of Oomph! -get a selfie with Oomph! -have a professional photo taken with Oomph! 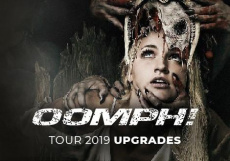 -experience the Soundcheck of Oomph!